December 5, 2012 – His Holiness Patriarch Kirill chaired a meeting of the supervisory board of the Sts Cyril and Methodius Post-Graduate and Doctoral School, at the patriarchal residence in St. Daniel’s Monastery, Moscow. Among the members of the board are Metropolitan Hilarion of Volokolamsk, head of the Moscow Patriarchate’s department for external church relations and rector of the Church Post-Graduate School, Archbishop Yevgeny if Vereya, chairman of the ROC Education Committee and rector of Moscow Theological Academy and Seminary, Bishop Ambrose of Gatchina, rector of St. Petersburg Theological Academy and Seminary, and Archpriest Vladimir Vorobyev, rector of the St. Tikhon Orthodox Humanitarian University. The meeting was also attended by governmental officials and representatives of public organizations and business community, among them S. Stepashin, president of the Imperial Orthodox Palestinian Society; Minister of Justice A. Konovalov; A. Beglob, deputy head of the Presidential Administration; S. Chemezov, director of the Rostechnologia state corporation; V. Yakunin, co-founder of the St. Gregory the Theologian Charity; N. Alekperova, president of the Lukoil Charity; sponsors A. Ananyev and S. Plastilin; A. Sokolov, rector of Moscow State Conservatoire, and others. Greeting the meeting, Patriarch Kirill stressed the important role played by the Church Post-Graduate School in the higher theological education system of the Russian Orthodox Church. Addressing the history of the Church during the persecution for faith in the 20th century, His Holiness underscored that it was marked with numerous losses. ‘For an external observer, these losses were associated with the loss of visible material signs of church life, such as churches and monasteries. But perhaps the severest blow was delivered against the Russian Orthodox Church’s education system. Not to mention even the parish schools, which had existed in the Russian Empire and which had actually provided preliminary education for our people, but to limit ourselves to theological institutions proper, we still have to state that almost everything was eliminated. A timid regeneration took place only after the Great Patriotic War’, he said. Patriarch Kirill also emphasized the importance of continuity in education, saying, ‘If continuity is broken, then the whole system is broken. When Lunacharsky was asked how many higher education schools one has to graduate to become a cultured person, he answered: Three, provided your grandfather graduated from the first one and you have graduated from the third one. It is correct. If there is continuity, education brings forth fruit, it is assimilated and, so to speak, works to build a cultural environment and to form an intellectual atmosphere, be it in society or the Church’. According to the Patriarch, in the 20th century 60s and 70s, there were the ‘youngest’ episcopal consecrations in the Russian Church, as men were consecrated as bishops at 30 to become metropolitans at 33 years of age. ‘Nobody could understand the kind of advanced approach the Russian Church took to her personnel, and it was the statement of an obvious fact that there was no middle-age generation of theologians in the Church; they simply did not exist. Old graduates from pre-Revolution schools (I had an opportunity to be taught by these remarkable people) were bearers of the knowledge taught by imperial theological academies. Then came a gap to be filled with great efforts in the 80s and to continue to be filled today’, he said. 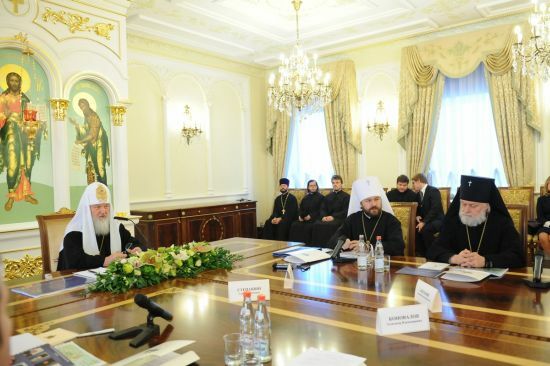 Speaking about the damage inflicted on the theological education and scholarship in the last century, Patriarch Kirill noted that it concerns in the first place the training of highly qualified theological cadres. The training necessary for celebrating divine services and delivering sermons as priestly skills was provided by post-war seminaries and academies while there was no opportunity for training scholars. ‘It led to a weakness of our position on international arena. I happened to attend many theological dialogues, unilateral and bilateral, and it is possible to explain it as none other than God’s miracle that we were able do at least something and to make at least some influence on people, because the level of theological training in the then Soviet Union was incommensurable with the commonly adopted European or American one’, he noted. ‘Now we are experiencing a different time as higher education institutions have been restored, theological schools are being basically reformed, and cadres from secular universities are being involved. By many parameters, our schools conform to the world level’, His Holiness said, pointing to the need to continue raising this level. However, he said, in the training of high-level theological researchers, the Russian Church is still very vulnerable. It is for precisely this purpose of making up for this shortcoming that the Church Post-Graduate School has been established. His Holiness also noted that the curriculum of this school is broader than just a doctoral school as it includes a Master’s course and several special courses including those which have a great importance for the training of bishops. As the Russian Church has been reformed in recent years, the number of new dioceses has doubled from 79 to 158. New archpastors have been consecrated to serve not in major administrative centers but in provinces. The Church Post-Graduate School has provided training for future and newly-consecrated bishops. ‘In addition, the Church is now carrying out a large-scale ‘legislative’ work to prepare some fundamental documents to regulate every sphere of church life, such as church-state and church-society relations, development of social service, missionary, educational and youth work. All this requires general fundamental theological documents because nothing in the Church can be done for pragmatic considerations alone. All has to be based on theological documents. On the basis of these theological texts, documents are drafted with the aim of organizing all the aspects of church life’, His Holiness said. This layer of extremely important materials should also be included in the educational process, especially in the process of training archpstors and raising the level of their competence. ‘The training of higher theological cadres and church scholars and the development of conditions necessary for the establishment of research institutes of various theological profiles – this tasks is linked today first of all with the establishment and function of the Church Post-Graduate School’, His Holiness said. In conclusion of his remarks, Patriarch Kirill thanked sponsors for their active help and support for the development of theological education and church scholarship in Russia. Metropolitan Hilarion presented to the meeting the structure and work of the Post-Graduate School, which is a successor of the Moscow Theological Academy’s branch at the Department for External Church Relations. He also introduced the meeting to the educational process built in conformity with the educational standards adopted in Russia, to the development of contacts with universities inside and outside Russia and to the work of the Church Dissertation Board. The goal of the Post-Graduate Schools, he said, is to train a new generation of church scholars and theologians who have all the skills necessary for independent scientific and research work and for the practical implementation of its results in their church service. The meeting discussed prospects for the development of the Church Post-Graduate School and pointed to the need to restore the Patriarchal Chernigov Representation as an educational facility.